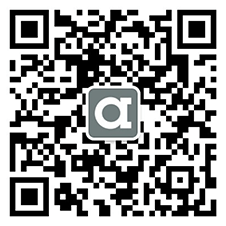 ab70114 detects endogenous levels of total AL-1 protein. Synthetic peptide corresponding to Human AL-1 (internal sequence). 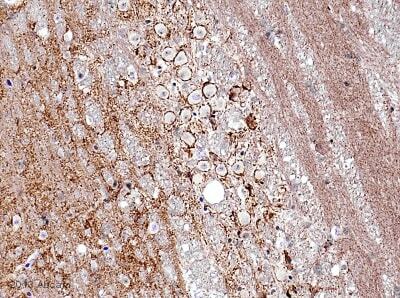 A549 cells, HeLa cell extracts and human brain tissue. Previously labelled as Ephrin A5. 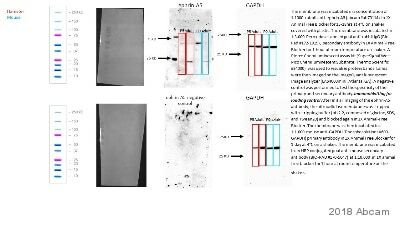 ab70114 was affinity-purified from rabbit antiserum by affinity-chromatography using epitope-specific immunogen. Our Abpromise guarantee covers the use of ab70114 in the following tested applications. WB 1/500 - 1/1000. Detects a band of approximately 24 kDa (predicted molecular weight: 26 kDa). May function actively to stimulate axon fasciculation. Induces compartmentalized signaling within a caveolae-like membrane microdomain when bound to the extracellular domain of its cognate receptor. This signaling event requires the activity of the Fyn tyrosine kinase. Cell membrane. Membrane > caveola. Compartmentalized in discrete caveolae-like membrane microdomains. 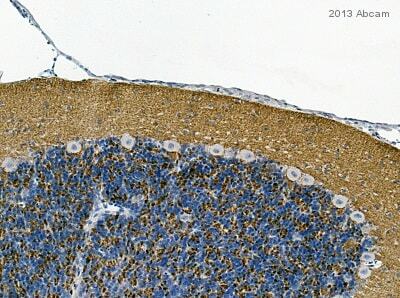 Immunohistochemistry (Formalin/PFA-fixed paraffin-embedded sections) - Anti-AL-1 antibody (ab70114)This image is courtesy of an anonymous abreview. 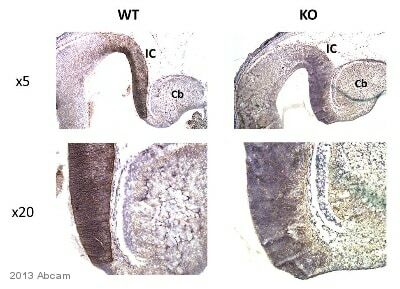 ab70114 staining anti-AL-1 in wild-type and knockout mouse inferior colliculus/cerebellum tissue sections by Immunohistochemistry (IHC-P - paraformaldehyde-fixed, paraffin-embedded sections). Tissue was fixed with paraformaldehyde and blocked with 1% BSA for 15 minutes at 20°C; antigen retrieval was by heat mediation with citric acid. Samples were incubated with primary antibody (1/200 in 1 % TBS/BSA buffer) for 2 hours at 20°C. A Biotin-conjugated Goat anti-rabbit IgG polyclonal (1/200) was used as the secondary antibody. ab70114 at 1/500 dilution staining AL-1 in A549 cells by Immunofluorescence, in the absence or presence of the immunising peptide.